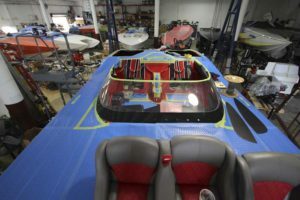 TNT Custom Marine is the world leader in high performance race boat rigging & setup. We are also the industry leader for custom rigging & re-power projects large and small. When it comes to custom rigging … TNT is the Industry leader offering State-of-the-Art rigging, digital electronics and an extensive selection of power options. As well respected racing and pleasure boat rigging experts, we have completed over 300 custom projects in the high performance and race boat market. Over 50 race boats have been rigged earning 100’s of wins with and numerous championships, clients trust their offshore competition boats to TNT Custom Rigging.